Gordon, I think the term "War Office" relates to the Government Dept. who were responsible for the War Department Constabulary. They were re-named Army Dept. Constabulary in 1964 and became part of the Ministry of Defence Police in 1971. Dave. Gordon, I'm attaching the details from the book in question which I hope is helpful. Henry Pierrepoint was Albert's relative. Albert himself does not appear on the scene as an Assistant Executioner until 1935. Dave. My information in respect of CHRISTIE has been taken from "The Encyclopaedia of Executions" by John J. Eddleston which details every execution (and the background to the trial and conviction) carried out in the British Isles between 1900 and the last hangings in 1964 which took place on the same day and time at HMP Manchester & HMP Liverpool. The primary sources for the information contained in the book came from Assize documents held at the Public Record Office at Kew . CHRISTIE apparently admitted at interview murdering each of the persons whose bodies were found in his house and those buried in the garden. The only exception was a baby girl, the daughter of the man EVANS. He was particularly keen to do so as he thought that by so doing it would demonstrate clearly that he was insane; thus saving him from the hangman. These admissions by CHRISTIE, were later used as the basis of Timothy EVANS being granted a full pardon in respect of his conviction and execution for murdering his wife and daughter. The people who CHRISTIE admitted murdering are named in the book. There is no indication that he was only charged with one murder. Dave. Just to round this off, so to speak, CHRISTIE was convicted and sentenced to death on 25th June 1953 by Mr. Justice Finnemore at the Old Bailey. He was executed at HMP Pentonville by Albert Pierrepoint on Wednesday 15th July 1953. Although he was convicted of the murder of seven persons, the police believed his victims numbered as many as twelve. Dave. Having regard to Christie's activities, I would not be inclined to take any notice of medal ribbons he may be wearing. The man was obviously seriously disturbed and was probably always so. He was also a "con man" of the first order. He gave evidence at the trial of a man (Timothy Evans), who was subsequently wrongly executed for a murder that he (Christie) committed. Dave. If he was a War Reserve (and I believe he was), he would not have been entitled to the SC LS medal. His entitlement to the Defence Medal would depend on how long he served. In any event, I doubt that he would ever have been awarded it. He had a rather pressing appointment with Albert Pierrepoint. Dave. There would probably have been one on his personal file. Whether that still exists, is the question. The other avenue to explore, if you have not done so, is to try to trace any living relatives. They may be able to help. Dave. It is what it is. Many towns in the UK issued them. The only way you are likely to get any additional information is to examine the Watch Committee minutes for the period in question or perhaps there may have been some mention of an award in the local press. Dave. Peter, Interesting that you should mention the murder of Constable Pritchard of the Anglesey Constabulary. Attached is a photo of his murderer being arrested. The Senior Officer at the back of the group is the Chief Constable of Anglesey, Robert Protheroe. I guess that there can be few occasions when the CC leaves his office to supervise an arrest. That said, the murder of a bobby on the (then) sleepy island of Anglesey must have been an earth shattering event. Of course, in those days the police prosecuted in the lower courts and I'd wager that Mr. Protheroe himself prosecuted at the murderer's first appearance at the Magistrates Court. Dave. They had better hurry up. PCSO's are on the way out. Norfolk Constabulary have scrapped their entire compliment. The CC stated that when they were introduced, they were a good financial option. However, over the years their salary has increased to the extent that they are now not much cheaper than a recruit Constable. As a result of the cash saved he has been able to recruit 80 probationers. I visited London recently and was amazed to see PCSO's walking around in threes, and on one occasion there were four of them chatting on the corner of a street! The Met. obviously have far too many, with not a lot to do. Dave. 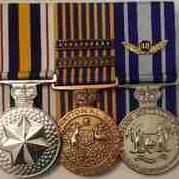 I don't suppose it will be too long before they introduce a long service medal for the Border Agency. I think that's their current name, although its difficult to keep up. They keep on changing it, and their uniform etc ! Dave. You have a mixture of current and obsolete. Regrettably, I don't have the time to go through such a large number. Someone else may be able to oblige. As an aside, I see that you live in Australia. Most of the items shown are easily obtainable in the UK for quite reasonable cost and in view of the cost of postage I would suggest that you attempt to dispose of them in your own locality. Dave. Perhaps you would kindly supply me with a list of those (other than Fiji) that still display the Queen's Crown on the headdress insignia of their police and military and utilise the Queen's Crown as part of their rank insignia. Republic's I'm talking about, not Commonwealth countries where the Queen is still head of state. I look forward to hearing from you. Dave. I'm sorry but I don't go along with the rather over simplistic theory as outlined in your first paragraph. Fiji achieved independence from the UK in 1970 - 48 years (nearly half a century) ago. I'm fairly certain that in the last 48 years they would have had a need to place orders for insignia, both for headdress and for rank insignia. Not on one, but almost certainly on many occasions. As far as I'm aware they have regular contact outside Fiji both by sea and air. They are certainly not isolated as you seem to be suggesting. They have a comprehensive range of post - independence medals which I suspect are manufactured outwith Fiji. So, no, I don't think this it is a supply or cost issue. There are other, perhaps, political reasons. They certainly are the only ex. colonial Republic that I know of that has not demonstrated its "divorce" from the UK by removing from its police and other disciplined services all vestiges of British colonialism. I wonder why? Dave. The current ones have press studs. Previous issues have had a brass buckle and also an anodised gold buckle. Dave.